First things first. I LIKE SLIGHTLY STOOPID! There I said it. I know there are many peeps that don't exactly care for SKA brand of music but I do. From the first time I heard The Specials way back in the early 80's, I've been a fan of this brand of music. So with that out of the way, let's begin our review, shall we? Olympia Washington native Ethan Tucker set the pace for the evening with a smooth acoustic set. If comparisons are going to be made, I would put Ethan as part Dave Matthews part Ben Harper. 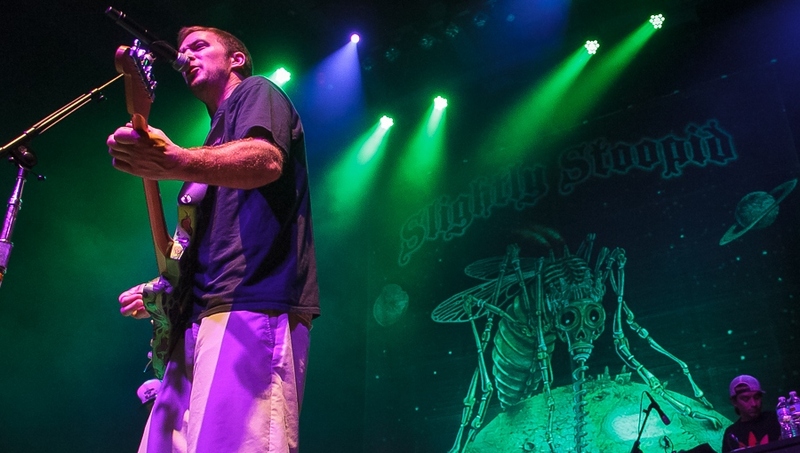 Members of Tribal Seeds and Slightly Stoopid appeared onstage at various times assisting Tucker with his solo performance. Tribal Seeds increased the mellowness of the evening with a stage that was awash with red and blue lights (a photographer's nightmare). A suitable middle act, Tribal Seeds lean more toward the reggae side of ska. In 2008, Tribal's self-titled debut was dubbed by iTunes as one of the best 8 reggae albums of 2008. Lead singer and co-founder Steven Jacobo, wearing a pair of dark Ray Bans throughout the band's 45 minute set, gave off the vibe of the band's southern California roots on a cold St. Louis spring night.